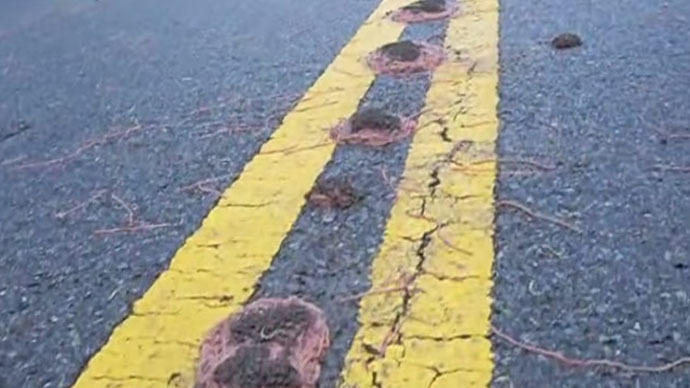 Stringy clumps of living, squiggling worms in inexplicably organized lines have turned up in the middle of the road in Texas state park. The ‘spaghetti’ phenomena puzzled scientists as the piles were only found in one park. “Rangers at Eisenhower State Park near the Oklahoma border found these clumps of earthworms in the road. Recent flooding may have brought out this herding behavior,” said Texas Parks and Wildlife, the state agency that protects wildlife and their habitats. Eisenhower State Park said it was puzzled by the “spaghetti” phenomena as the piles were only found in this exact park that was closed off to vehicles because of recent floods. “Why have the worms started congregating on the roads? Has the recent rain brought them together? Let us know what you think!” the park, which covers 423 acres of land, wrote on its Facebook page. The rangers decided to poke the squiggling piles with a stick to ensure that there were only worms in the clumps. The Texas storms that struck the region in May killed at least 24 people and prompted mass evacuations. The area has already received six times more rainfall than typical for an entire month, Accuweather said. The region has been badly affected by tornadoes, heavy rains and thunderstorms as of late. People have been evacuated from their homes, sometimes being rescued from their roofs. Thousands have been left without electricity, and flash flooding has damaged hundreds of houses and washed away bridges.